Taste test: This version of Tostitos brought sort of a bell shape to the usual tortilla chips, with an added light hint of flavor powder. 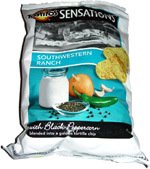 The ranch taste reminded me of Doritos Cool Ranch, but the addition of the peppercorn made it a bit spicier and left a hot aftertaste. 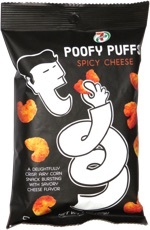 It was a pretty good snack, and I ate more than my share from the bag during the tasting session. There's need to add salsa or queso to these tortilla chips — the flavor powder will do it all for you. Smell test: It does smell a little peppery with a hint of ranch. This snack was discovered by Keith at Stop & Shop. Review published .